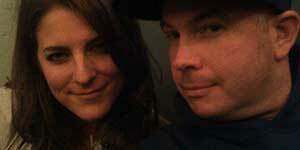 Cat Gendell and Josh O’Brien pose together for a selfie after the March 2015 show. Actress Cat Gendell tells story about how blind love can be no matter how manically the bright red flags wave. Cat joined us for our March 15 storytelling night. “Loyalties” was the word for the night, and “Lovesong,” by The Cure, was the song.